Last week we discovered Winkworth Arboretum, a National Trust site close to Godalming. It comprises an extensive wooded valley with a lake, once owned by Dr Wilfred Fox to use ‘as a canvas for planting trees to paint a picture’. Dr Fox was Chairman of an organisation with the quaint title: ‘Roads Beautifying Association‘ and Winkworth, it seems, was at least in part an arboreal experiment by Dr Fox. The NT claim Winkworth contains over 1000 different plants. It is a place of colour throughout the seasons and when we visited last week Camellias and Rhododendrons were in flower. Bluebells were also in bloom although they had failed to provide the blue carpet that I had hoped to find. But in such environments my eyes often look up and a soaring tree always attracts my attention. Another rather hackneyed subject, but so what…still worth an image. This entry was posted in Country Houses & Gardens and tagged Black and White Photography, Photography, Winkworth Arboretum. Bookmark the permalink. 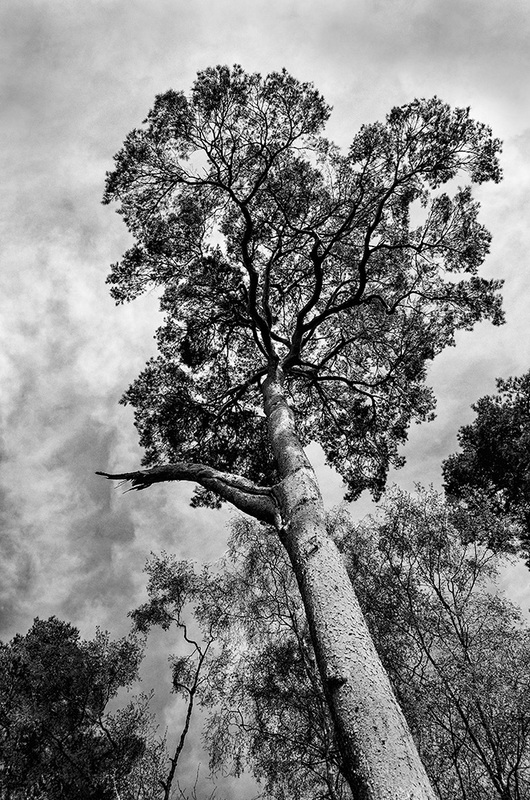 Love the monochrome choice and the angle of tree leading to the impressive top Andy. You said something I’ve heard in other places, and that really piques my curiosity.. Why is it that so many wonderful photographers often seem to half-apologize for supposedly “hackneyed” subject matter? Granted, there are plenty of photos taken looking up into a tree, but every one is different. Even if a half-dozen photographers were ranged around this particular tree at the same moment in time, no two images would be the same. And, given the number of trees in the world — tall, short, elegant, ugly — there probably is an infinite number of photos that could be taken. In any event, I think it’s a wonderful image. Do you see the distinctly African-mask-like face in the lower portion of the trunk? The eye, nose, and mouth seem quite clear to me, and the arrangement is nicely proportional. No, I hadn’t seen the face, Linda, but I can now. Your comment about ‘hackneyed’ subjects has had me thinking through the day how best to answer that point simply. Here goes: We live in a time when photography belongs to the masses like never before and the number of image taken is increasing exponentially. Anybody can take a competent photograph – technology sees to that. One of the results is that certain ‘types’ of image are commonplace and are taken so often, and almost precisely reproduced, that the original thought involved in taking early examples of that ‘type’ is lost in a mass of copycat shots and so the image becomes ‘passé’ or ‘hackneyed’ because everyone has seen it (and taken it) and it has lost the ability to surprise. I still take those shots because I want to, and my archive would not be complete without them, and of course I try to find a slightly different approach but they are never going to win plaudits and their capacity to surprise is diminished. One of the consequences of the huge surge in digital imaging (and it worries a number of photographers) is that we run out of ideas and photography as a result risks being dumbed down. Jim Nix, a talented photographer has written (when discussing this issue) that we ‘need to rise above the noise’. It’s a very apt way of saying we have to get creative and try harder to stay ahead of the pack. I very much like that expression: to “rise above the noise.” And what you say about the profusion of images makes sense. Perhaps my approach to photos makes the concept of a “hackneyed image” less obvious. I’m not on Facebook or Instagram. I don’t frequent sites like Flickr, and I never pay attention, or take part in, photo challenges and such that are so common in the blogosphere. Instead, I follow a few really top-notch photographers — perhaps a dozen now — and that’s it. While I certainly look at other bloggers’ photos, and sometimes evaluate them (to myself only!) I don’t give them the same close attention that I give the people whose work interests me, and is of high quality. In other words, as a viewer of photography and a novice photographer, I make my own attempts to reduce the noise — to pick and choose what I look at, in order to keep the clutter down. Now that I think about it, the photographers I do follow share one quality: their images rarely seem stereotypic. But I can think of one example that might illustrate what you’re saying. Some really good photographers will post wonderful “starburst” sunrises or sunsets. Very often, I find them less attractive than other photos because so many pedestrian photos are out there with starburst suns applied by means of editing programs. What some people achieve with timing, special filters and lenses, and knowledge of the land, others create with the click of the mouse. The result? A hackneyed image! I am privileged to be one of the photographers you follow, Linda. Sunrise and sunset shots are high on the list of hackneyed images – I know of one club where there is a derogatory saying: ‘not another b****y sunset!’ And it also very true that the more one immerses oneself in photography the more likely you are to find those repetitive images that we have been talking about. Not ‘hackneyed’ at all. A full range of tones, good composition, a compelling leading line – there is not yet a camera that can select the frame for you. And, thanks for the reference to Jim Nix in the comments: I shall be taking a look. Thanks for the link. Always like to look and try to learn from good photos. An interesting place and a very interesting photograph Andy! Superb! There’s a lot of walking to be had in this Arboretum, Adrian. We only scratched the surface on our first visit and I didn’t come away with many images but it’s always looking up to see what’s overhead.